FAQ: On Alleged Wiretaps Of Trump Communications : The Two-Way President Trump accused his predecessor of monitoring his communications. Here is a rundown of the allegations, federal surveillance powers, and what we do and don't know. 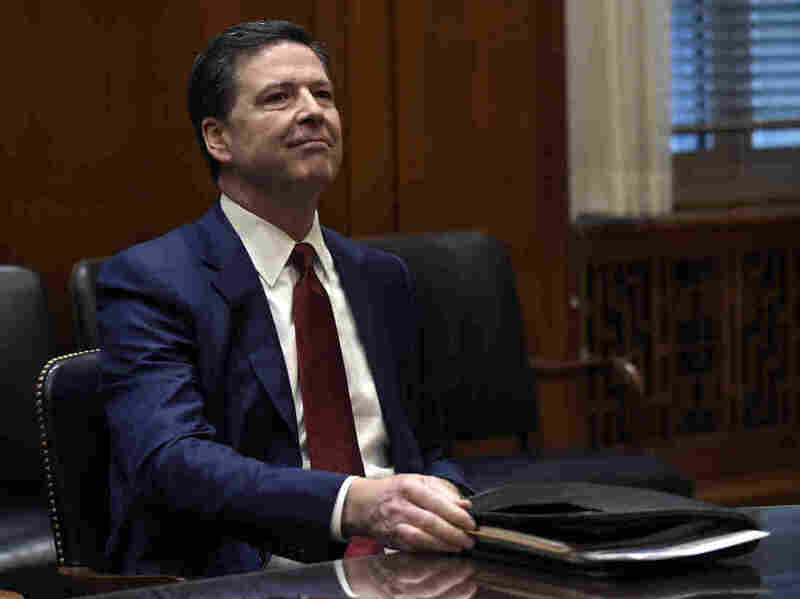 FBI Director James Comey has asked the Department of Justice to publicly refute claims by President Trump that then-President Barack Obama conducted electronic surveillance on Trump Tower in New York City last year. Over the weekend, President Trump accused his predecessor of "wire tapping" communications from Trump Tower in New York, where then-candidate and President-elect Trump lived and worked during the campaign and in the lead-up to the inauguration. Former President Obama has denied the allegations, as has the former director of national intelligence. A spokesperson for Trump called on Congress to investigate the claim. The FBI, the House and the Senate are all investigating Russian attempts to influence the U.S. election. As we have reported, at least three people associated with Trump's campaign communicated with Russian officials before Trump took office in January, but there are not many details about what was discussed in those communications, or details about what drew the U.S. intelligence community's attention. So, where did this all start? Only Trump knows why he tweeted what he did early on Saturday morning, but there were previous reports and allegations that the Obama administration might have been conducting surveillance on people close to Trump. Oct. 31: The New York Times reported that in the summer of 2016 the FBI had investigated whether the Trump Organization had connections to a Russian bank, but concluded that it did not. Nov. 7, 2016: The website Heat Street posted a piece by former Conservative British politician Louise Mensch stating that "two separate sources with links to the counter-intelligence community have confirmed" that the FBI twice sought warrants to "examine activities of 'U.S. persons' in Trump's campaign with ties to Russia." The article states that a June warrant request was denied, and that a second request in October was approved. Jan. 11: The Guardian reported that a June application by U.S. intelligence to the Foreign Intelligence Surveillance Court had been denied, and that the newspaper had not confirmed the Heat Street reporting about an October order. Jan. 12: The BBC reported that the June application had been denied, and quoted "a lawyer outside the Department of Justice but familiar with the case" saying the court had granted a request by U.S. intelligence to intercept electronic records from two Russian banks, and that the order involved three of then-President-elect Trump's associates. March 2: Conservative talk radio host Mark Levin accused Obama of using "the instrumentalities of the federal government, intelligence activity, to surveil members of the Trump campaign and put that information out in the public," on his radio show and podcast, The Mark Levin Show. March 3: The website Breitbart cited Levin in a post about alleged wiretaps dating back to October 2016. March 4: Trump tweeted, "Just found out that Obama had my 'wires tapped' in Trump Tower." What do intelligence officials say about the allegations? The director of the FBI, James Comey, asked the Justice Department to publicly deny the allegation. The Justice Department hasn't said anything. On NBC's Meet the Press on Sunday morning, James Clapper, who served as the director of national intelligence under Obama, said that to his knowledge there was no wiretapping on then-candidate Trump or his campaign. He also explicitly denied that there was any intelligence court order authorizing electronic surveillance of Trump. What is the FISA court again? The Foreign Intelligence Surveillance Act, or FISA, court is responsible for considering communication-monitoring requests from U.S. intelligence agencies. So, if the FBI wanted to listen in on telephone calls or other communications to and from Trump Tower, it might have requested a warrant from the FISA court, if the reasons for the surveillance pertained to foreign intelligence. A federal agency can also ask a federal district judge for a warrant to conduct electronic surveillance on U.S. citizens it believes are committing serious crimes. Such a criminal wiretap would go through the regular federal court system, not the special FISA court. Can a U.S. president single-handedly order the surveillance of an American citizen? As NPR's justice correspondent Carrie Johnson says: "No." Surveillance of an American citizen by U.S. intelligence or law enforcement requires that a federal judge or the FISA court sign off, and those orders are requested not by the White House, but by the FBI or Justice Department if they believe a crime has occurred. Because the requests and the FISA court orders are secret, it's difficult to get information about them. NPR's Mara Liasson reports that, as president, Trump could release any court order allowing surveillance of Trump Tower, if such an order exists. "He's the only one in the United States with that power," she explained. "He could also easily ask the appropriate agencies whether there was a wiretap." White House press secretary Sean Spicer said such action would be interfering in an investigation, and that Congress should look into it, Mara reported. What about the intercepted calls between Michael Flynn and Russian officials? U.S. intelligence agents intercepted communications between Russian officials and members of Trump's campaign, including Michael Flynn, who resigned from his post as national security adviser after he lied about the substance of a conversation he had with Russia's ambassador. "Russian intelligence officials made repeated contact with members of President Trump's campaign staff, according to new reports that cite anonymous U.S. officials. American agencies were concerned about the contacts but haven't seen proof of collusion between the campaign and the Russian security apparatus, the reports say. "Law enforcement and intelligence agencies intercepted the calls at the same time as they investigated Russia's attempts to tamper with the presidential election, according to The New York Times, which first reported the contacts." Trump's tweets have set off a public argument among the FBI, the White House, and the Department of Justice. On Monday, Spicer tweeted that the president wanted Congress to "determine whether executive branch investigative powers were abused in 2016." Meanwhile, the FBI is investigating Russia's attempts to influence the 2016 presidential election, and last week Attorney General Jeff Sessions announced he would recuse himself from any DOJ investigations or prosecution decisions involving the campaign. And the House Intelligence Committee is doing its own investigation into Trump's possible ties to Russia, as is the Senate Select Committee on Intelligence. And, to muddy the waters even further, the Justice Department is investigating the FBI director's actions leading up to the election.